There’s a couple movie releases that have been making the rounds on the festival circuit and have been slowly rolled out into wider releases that sound like they should be full-fledged superhero movies. So, I thought I would take a look back at a few more movies that should be superhero movies solely based on their titles. I don’t do a lot of parody posts here, but I do like playing around with photoshop so I thought I’d share with you what I think these movies should really be. Enjoy! 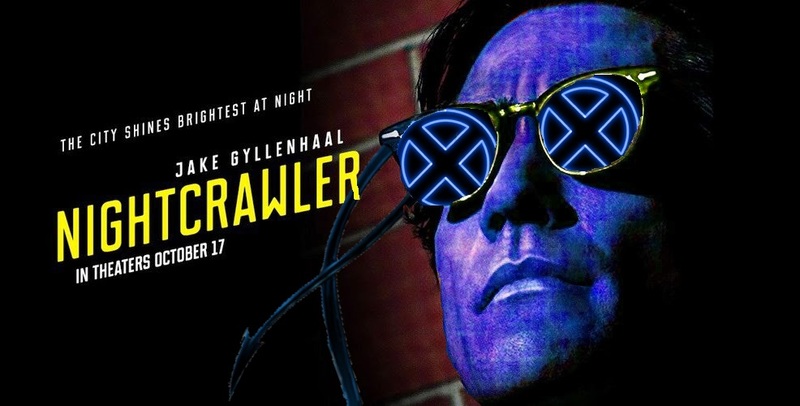 This is not an origin story, but it does center around the one-time X-Men mutant Nightcrawler with the blue skin, demon tail, and ability to teleport in a bamf of smoke. This would follow the timeline started with First Class where his father was Azazel and his mother is Mystique. He’s still relatively young, but he has come into his own powers and has spent time in the circus already when we meet him. The movie follows an anonymous tip that sends him on a quest to find his real mother when he runs across a small contingent of the X-Men consisting of Cyclops, Beast, and Storm. Ultimately, we find out that the ‘anonymous’ note was part of a plan masterminded by Mister Sinister. Fights, intrigue, and drama ensues. Actual IMDB Synopsis: When Lou Bloom (Jake Gyllenhaal), a driven man desperate for work, muscles into the world of L.A. crime journalism, he blurs the line between observer and participant to become the star of his own story. Aiding him in his effort is Nina (Rene Russo), a TV-news veteran. The father of a young boy around 6 or 7 years old seems to be a typical businessman absentee father who works long hours and is always getting calls to go into work while his son has to stay home and play by himself while his mother is usually passed out drunk. He spends most of his time watching reruns of Superman on TV while secretly collecting clippings of a mysterious vigilante who has been rescuing people off the streets. He crafts these flights of fancy within his imagination of how his father is secretly a superhero, fighting crime in the city with superpowers and a costume. One day he stows away in the back of the car and goes to work with his dad only to find out that his father is actually a high ranking member of a megalomaniacal criminal mastermind and there is a real superhero who has been cutting into their business. Actual IMDB synopsis: Charlie McCready (Bob Crane) is a worried father. His daughter, Wendy (Kathleen Cody) will be attending college in the fall, and he feels the crowd she’s hanging out with has no ambition, especially her boyfriend, Bart (Kurt Russell). He knows that Wendy’s friends will all be attending the same college, so, he concocts a plan where Wendy will recieve a scholarship to a different college. This college being the same one where his wife attended. All goes as planned. Wendy attends Huttington and sees less of her old crowd. Soon Charlie’s plan backfires, Wendy discovers her fathers scholarship plan and becomes rebellious. When she starts dating a hippie artist, Charlie realizes he has made a big mistake and must do something before Wendy goes too far. It’s the late 70’s, New York. A group of ex-military friends have been having a hard time finding work but still manage to hang out together each week at the local bar. One night a couple guys come in wearing ski masks and holding guns come in to rob the place. The friends work together to take the criminals out. It was such a high that they start looking for trouble and finding it in spades. 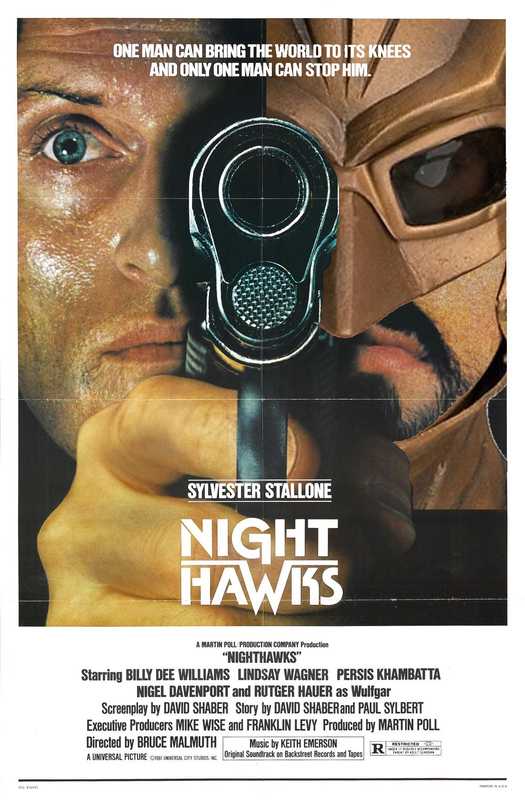 They get the idea to start wearing masks and calling themselves the Nighthawks, but get caught up in the middle of a mob war. They try to decide to call it quits, but they’re in too deep once one of their own gets killed and they have to see it through to the bitter end. Actual IMDB synopsis: Conservative street cop DaSilva (Sylvester Stallone) reluctantly agrees to terminate an international terrorist who has demanded media attention. But DaSilva’s “at-home” tactics are very much put to the challenge. There is an incoming threat from a distant alien planet, but luckily there exists an ancient technology buried deep underground that carries the secret of the Super 8. A talisman that has been split into eight pieces and spread across the globe, but when found by the chosen ones will grant them the powers to defeat this evil prophesied long ago. When found, they are embued with the powers of the 8 elements: Earth, Air, Fire, Water, Light, Dark, Mind, and Heart. When they combine their powers, they summon a giant spaceship hidden deep within the earth that will allow them to battle their alien foes. Actual IMDB synopsis: During the summer of 1979, a group of friends witness a train crash and investigate subsequent unexplained events in their small town. 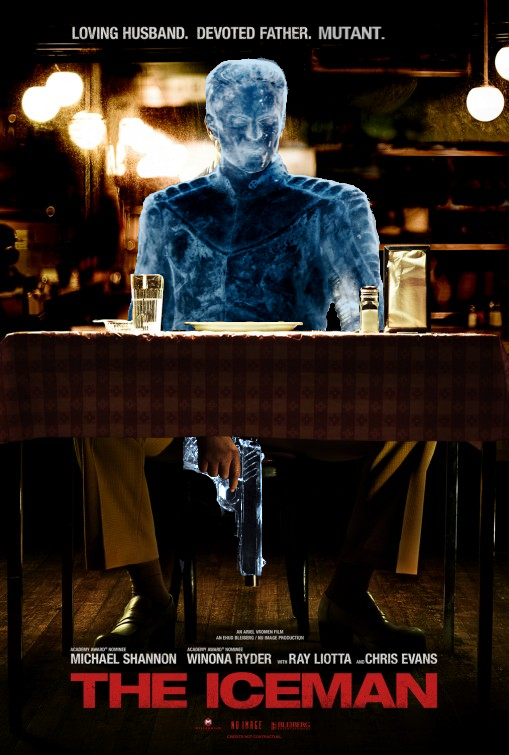 Surprisingly not about the X-Men mutant Iceman whose picture I used in the poster, but instead about a completely different superhuman that has the ability to control and manipulate ice. He is, ironically enough, a mob hitman who uses a gun and bullets of his own design made out of ice that he creates himself so they are untraceable regardless of what the Mythbusters have to say about how practical ice bullets actually are. Before one of his hits, he begins to think that something isn’t quite right and he starts investigating who his target actually is. The deeper he gets into his investigation, the more doubts he begins having until he reaches a turning point and decides to use his talents against his own employer, working his way up the chain of command before ultimately going out in a blaze of glory. Actual IMDB synopsis: The true story of Richard Kuklinski (Michael Shannon), the notorious contract killer and family man. When finally arrested in 1986, neither his wife nor daughters have any clue about his real profession. No fake synopsis for this one, but I thought I’d share my (badly done) photoshop to see what Birdman would look like if they went with the traditional Hanna Barbera look instead of their more original take on it. Which synopsis did you enjoy the most? Do you think any should become an actual movie? Would you like to see more parody posts like this one? Leave a comment to let me know what you think. Until next time, this has been Bubbawheat for Flights, Tights, and Movie Nights. 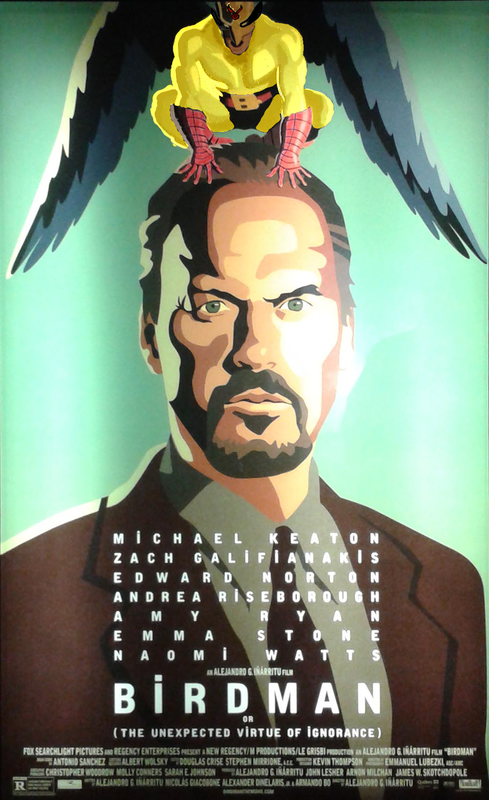 Posted on November 4, 2014, in Lists and tagged film, movies, parody, Superhero. Bookmark the permalink. 2 Comments. The Hurricane is a good one, I considered doing the Weather Man but didn’t get around to it. Thanks, glad you liked it!